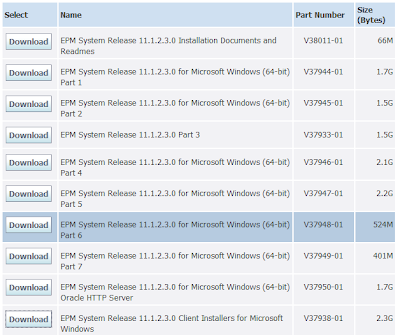 For the last five years I have written a blog about the installation of each release of EPM 11 and this year there is going to be no exception as 11.1.2.3 has just been released. This release brings a large number of bug fixes, new product features and changes to installation and configuration which I will be covering today. This blog is only going to be highlighting where there are changes from the previous 11.1.2.2 release and not a detailed installation guide as there are a number of documents now available that help cover that area. I highlighted the key new installation/configuration features in my last blog. The key change being there is no direct upgrade patch from 11.1.1.3 anymore. Log Analysis Utility is available to troubleshoot EPM System issues. Shared Services Console integration with Workspace. 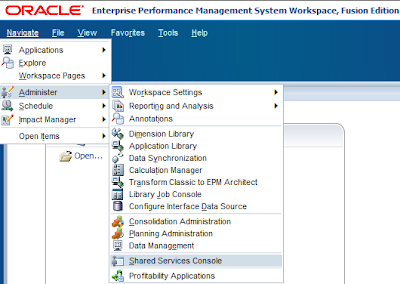 You access Shared Services Console using a menu option in EPM Workspace. Move application artifacts from one environment to another by downloading the artifacts from the File System node in Shared Services Console. 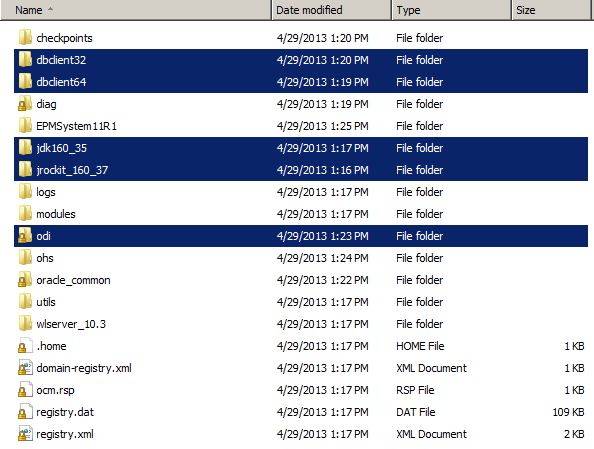 Downloaded artifacts are saved in a ZIP file, which can be uploaded to another environment. After applying a patch to Release 11.1.1.4, import data sets into Release 11.1.2.3. LCM now supports Oracle Essbase Studio. An Artifact Change Report that identifies changes made to artifacts in EPM System. This report can be generated from the Lifecycle Management user interface and by using the command-line utility. New command-line utilities to help clone the applications supported by LCM from one environment to another. 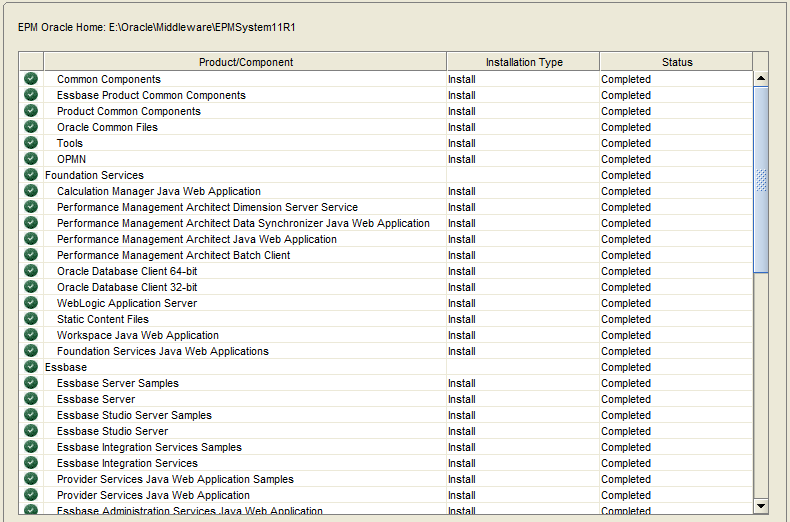 The installation files are available as usual from Oracle Software Delivery Cloud. Microsoft Windows Installer (MSI) Client Installers are now provided for EPMA, Strategic Finance, Interactive Reporting, and SQR Production Reporting. There are no noticeable changes with the prerequisite checks. In the list of top level product components ERPi has now been rebranded to FDM Enterprise Edition. Any J2EE web applications are now named “<product component> Java Web Application” instead of “<product component> Web Application”. 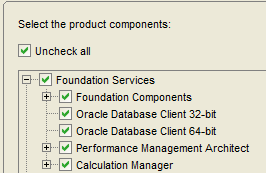 If you expand Foundation Services you will notice that Oracle 32 and 64 bit clients can be installed which is definitely a bonus. 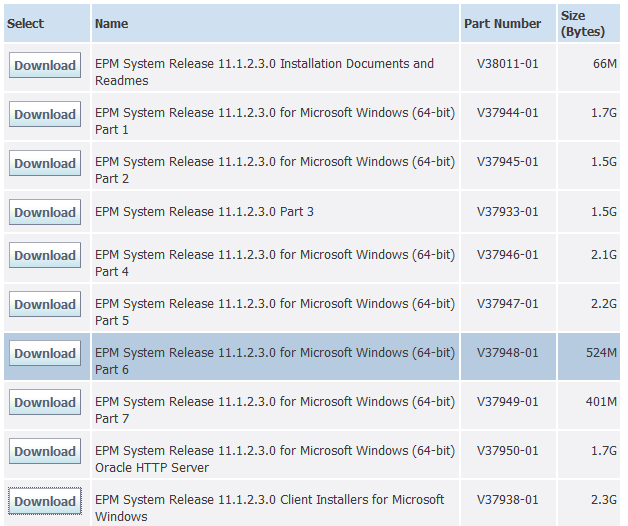 As there is now a client installer available for EPMA the batch client and file generator options have been removed. For the Essbase and PCM product components there is now the option to install the samples separately. 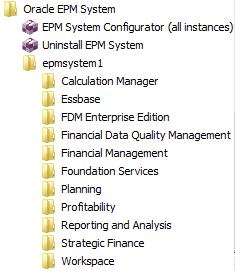 If you choose to install FDMEE you will see that ODI is automatically installed. All the product components installed successfully. Java 7 has not made it to this release and the versions deployed are still 6. 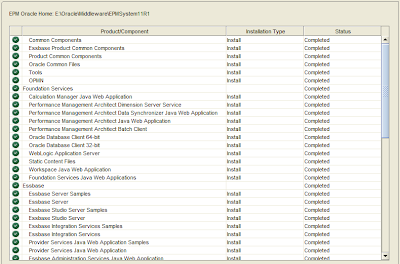 ODI components are installed under the home directory. The Oracle clients are available from the start Menu. So which version of the client has been installed? 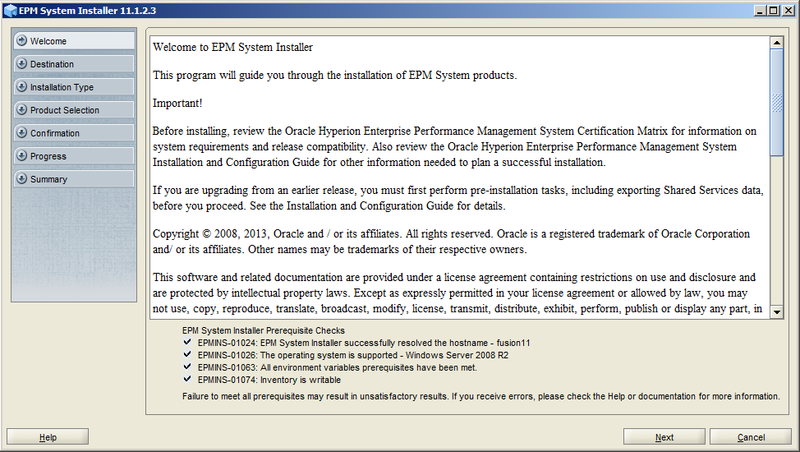 On to the EPM configurator. Only change in this version is the message about the instance homes. Now as this is not a configuration guide I will just highlight the differences that I have initially spotted with the options available. EPMA Dimension Server configuration has now been separated. This allows you to define the ports to use instead of having to update properties. FDMEE has an option to register the HFM adaptor and if the adaptor is being registered the Financial Management “Configure DCOM” task must also be run. The database for Oracle Data Integrator is in same database as FDMEE and the Oracle Data Integrator agent application is deployed in same JVM as FDMEE. If you select to configure Framework Services you can now also define the ports for the agent. Personally I think the best new option in the configurator is the ability to configure all databases at once without having to put them in the same schema/database. The deploy to a single managed server is still enabled by default which I am not a fan of. 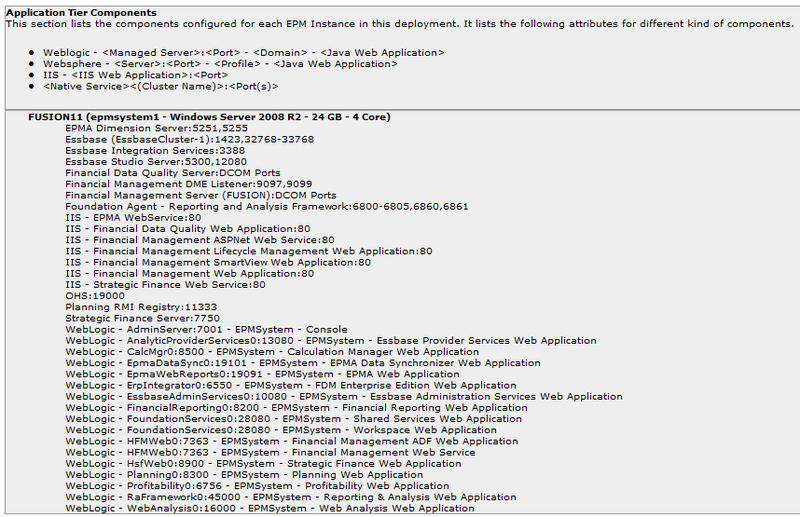 Even though ERPi has now become FDMEE the managed server is still called Erpintegrator. There has been a new advanced option added to the configuration of OHS, it is now possible to use shared location for the configuration which is extremely useful if there are multiple http servers deployed in an environment. Anyway I had no problems with configuration and everything completely successfully which is nice. If deploying on Windows you will notice a change in the start menu. The Windows Start Menu and the Services Control Panel now reflect separate product instances. 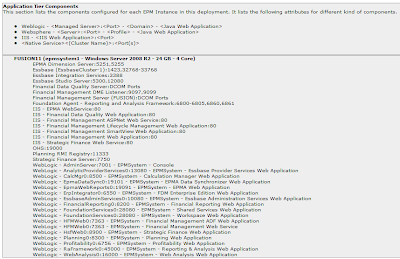 If you run the EPM deployment report there have been some updates to it. In the application tier section there is additional information available compared to the previous version. The database connection section now includes the size of the data. 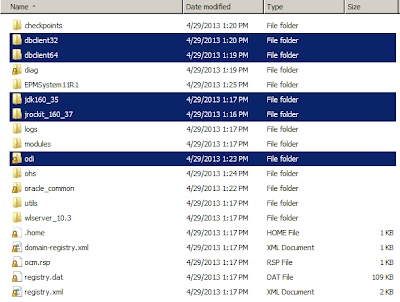 The data/instance directories section includes the size. 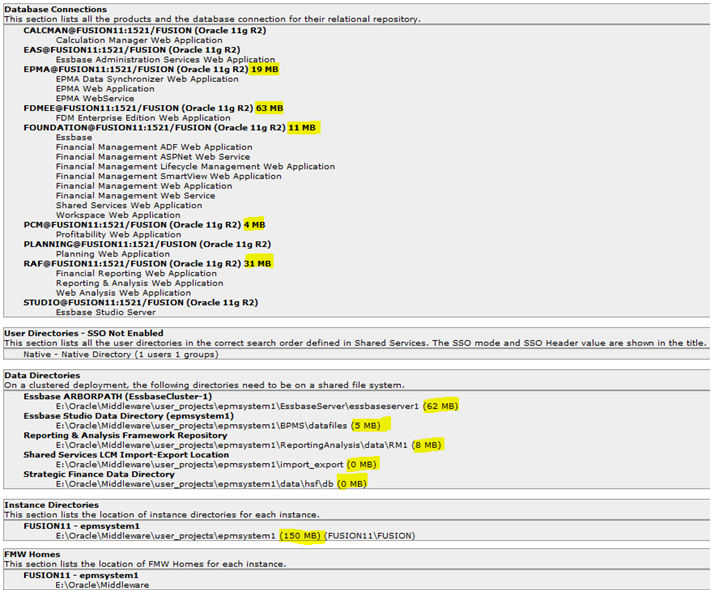 The middleware home location is listed for each instance. As hightlighted in the key new feature there is an update to accessing Shared Services through Workspace. At last it opens in its own tab instead of that annoying pop-up window. 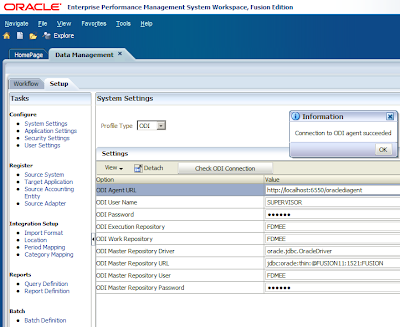 Within Data Management the ODI agent and Repository information are automatically configured, there is a “Check ODI connection” button that tests the agent is running which is a nice feature. If you take a look in the WebLogic admin console and the FDMEE managed server you will see that the ODI console and agent have been deployed as part of it. 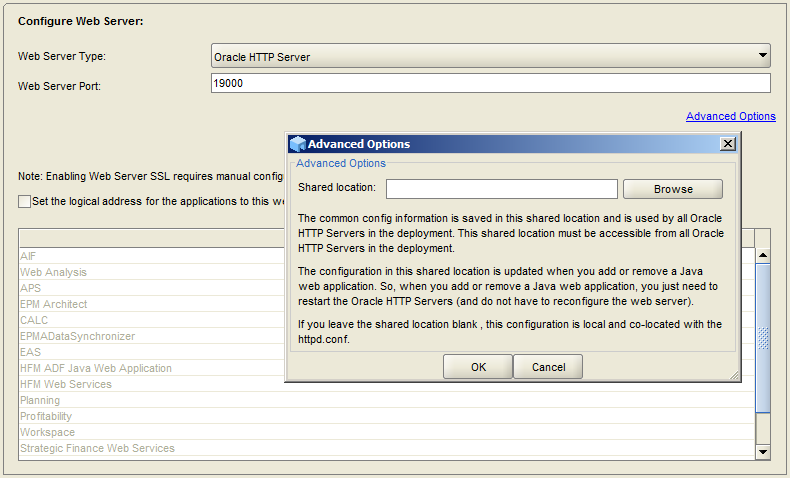 The ODI studio is not automatically deployed so that requires to be installed separately. If the Studio is installed then it can be configured to point to the FDM database which contains all the ODI tables, the agent will have been automatically configured by the EPM configurator. Alternatively the automatically deployed ODI console can be used. Well I think that about covers all I want to today and once I have had a chance to look at some of the other new features in more detail I will return. 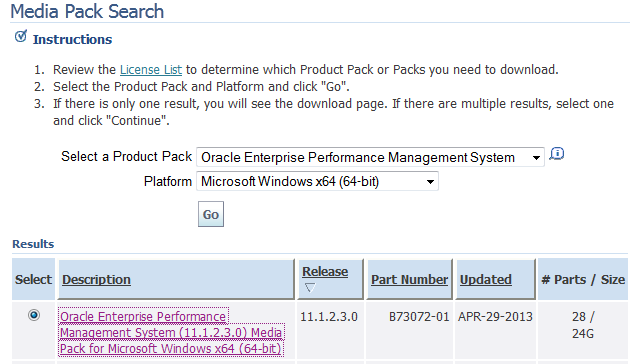 Just a quick update from me, EPM 11.1.2.3 is now available on Oracle Software Delivery Cloud. You can use Oracle Hyperion Enterprise Performance Management System Configurator to remove an EPM Oracle instance, for example, if you want to scale down a deployment by removing an instance or you want to remove an incorrectly configured instance. If you are installing and configuring Oracle Hyperion Financial Data Quality Management Enterprise Edition, Oracle Data Integrator is automatically installed and configured for you. The database for Oracle Data Integrator will be in same database as FDMEE, and the Oracle Data Integrator agent application will be deployed in same JVM as FDMEE. The rapid deployment process now uses a simple wizard to install and configure EPM System components and Oracle database. Standard Deployment now includes Oracle Essbase Studio, Oracle Hyperion Profitability and Cost Management, FDMEE, and Oracle Hyperion Strategic Finance. 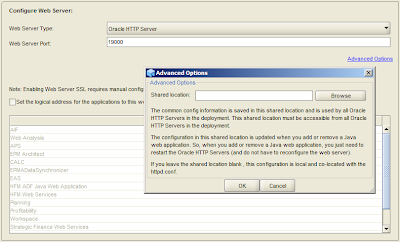 You can configure Oracle HTTP Server to a shared drive location to simplify configuration in a distributed environment. 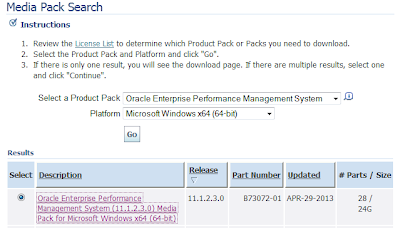 Microsoft Windows Installer (MSI) Client Installers are now provided for Oracle Hyperion EPM Architect, Strategic Finance, Oracle Hyperion Interactive Reporting, and Oracle Hyperion SQR Production Reporting. EPM System products support vertical scaling for Oracle Essbase Server, UNIX-based components, and Windows-based Java web applications (except for all Oracle Hyperion Financial Management components, all Strategic Finance components, all Oracle Hyperion Financial Data Quality Management components, Performance Management Architect Dimension Server, and Essbase Integration Server). A new Log Analysis tool is a command line utility that helps you quickly identify the cause of issues by analyzing the applicable log files. Because this tool automates log file analysis,you do not need to locate and scan through product log files to identify system issues. 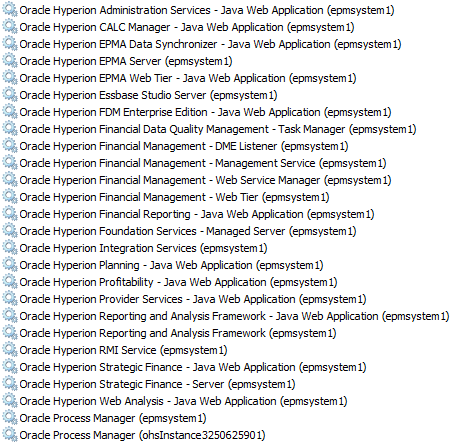 Oracle Hyperion Financial Close Management now supports SOA clusters. Oracle Hyperion Enterprise Performance Management Workspace now integrates with Oracle Business Intelligence Enterprise Edition 11.1.1.7. You can access the database repository using an LDAP-based URL. Port Manager, a feature of EPM System Configurator, manages port uniqueness by using Oracle Hyperion Shared Services Registry to check if a port is in use. Port Manager auto increments ports so that ports not already in use are always shown. Release 11.1.2.3 supports applying the maintenance release for WebSphere configuration from prior 11.1.2.x releases. The recent release of OBIEE 11.1.1.7 finally added in the ability to provide single sign-on integration between EPM Workspace and OBIEE, yes the functionality has been available for a while if integrating Workspace with 10.1.3.4.2+ though this was a complete hack and required installing Shared Services 11.1.1.4 plus the biggest drawback was that it was not available for OBIEE 11g. Now I know there is also the option of installing a cut down version of Workspace when selecting the Essbase option with the OBIEE 11.1.1.7 installer but this is not EPM as you know it and from initial testing it is far from the finished product, interesting to see the EPM products operating in fusion mode and not Shared Services security mode but not pleasant if you are used to provisioning in Shared Services, definitely one to watch for the future though. Anyway today I am going to go through the process of setting up the SSO integration between Workspace 11.1.2.2 and OBIEE 11.1.1.7, it is possible to integrate with previous versions of workspace with the process being the same for 11.1.2.1 and only slightly different for versions prior to that, though I don't it has been really tested on those versions. If you are expecting to run an installer then sit back and relax you will be disappointed as the process is manual and is still a bit of a hack but at least you can keep with the same version of Shared Services, the process does involve updates to the Shared Services registry and anybody that has experience with the registry will probably be well aware that bad things can happen if incorrect entries exist. 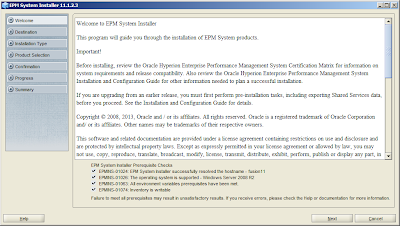 Update 27/05/13 : If you plan to integrate with EPM 11.1.2.3 then make sure you carry out the steps of copying the two jar files which is explained in the following blog. Update 09/08/13: If you are running OBIEE with SQL Server then there is currently an issue which you can read about here. There are a few prerequisites that need to be met before carrying out the integration. Supported versions of OBIEE and EPM Workspace are up and running, so this means OBIEE 11.1.1.7+ and I am going to say Workspace 11.1.2.1+ as it is time to upgrade if you are running earlier versions and are considering integrating. 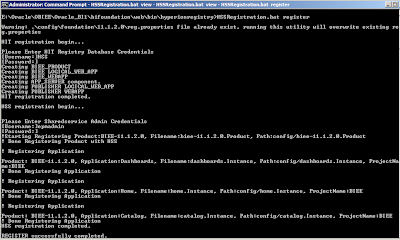 OBIEE and EPM including the registry relational database can be accessed from each instance. OBIEE and EPM are configured to use the use the same identify store such as Microsoft active directory which I will be using in my example, native security is not really a viable option. The first step is allow OBIEE to accept the EPM SSO token when integrating with Workspace which basically means that both the EPM registry and the OBIEE version of the registry need to keep a shared encryption key. 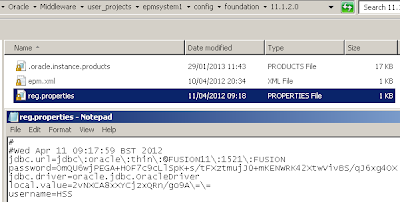 The utility is contained in the file regSyncUtil_OBIEE_TO_EPM.zip which should be extracted to the same location. 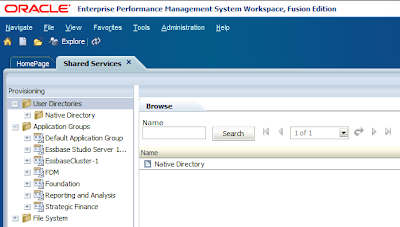 In order for the utility to be able to extract the required information from the EPM registry it needs the database connection details and it does this by using the reg.properties file from the EPM instance. 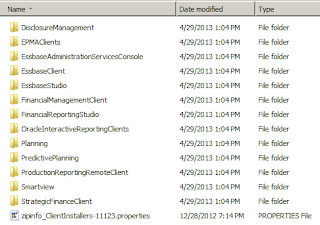 reg.properties should be copied to the src folder of the Registry Sync utility. Before the utility can be run a couple of variables will require updating. 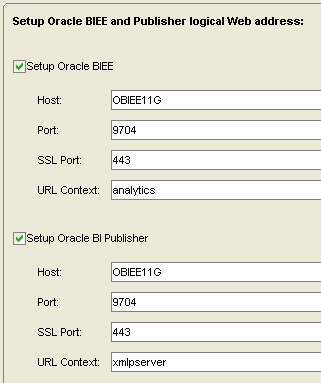 ORACLE_HOME and ORACLE_INSTANCE should be updated to match the paths for the OBIEE instance. Now the utility can be run. If a report is run on the OBIEE version of the EPM registry before and after running the utility you will see the CSSHandlerKey2 property value is updated. Basically the utility reads CSSHandlerKey2 from the EPM HSS registry and then writes a new encrypted key based on the EPM value to the OBIEE EPM registry so now there is a common link between them when handling SSO tokens. This can be achieved by running the epmsys_registry utility which if you have worked in the EPM infrastructure world you will know well. Running a registry report again confirms the property has successfully been removed. Next step is to make sure the interop-sdk.jar file is the same version between the EPM and OBIEE environments. So you are thinking that is it then, don’t be silly life would be boring if it was. The EPM registry has not yet been configured with any OBIEE information such as registering it with workspace. This option should only be used when integrating using the old method to OBIEE 10g though I am sure it will be updated in future releases. 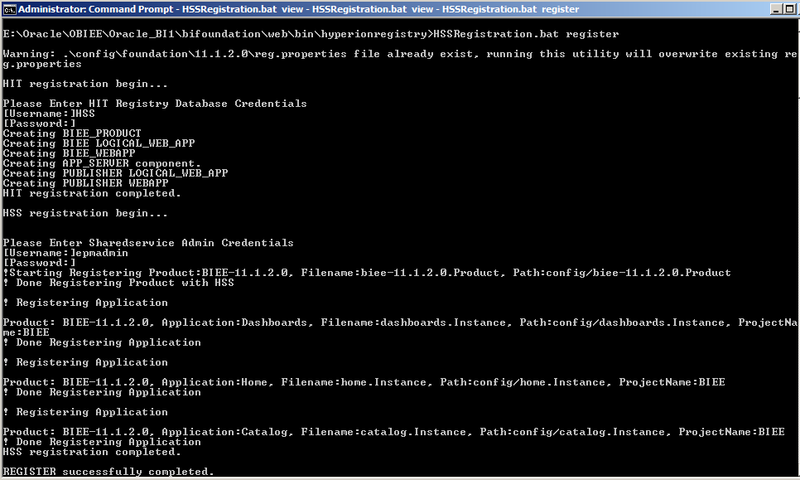 The way to correctly register at the moment is to the HSSregistration utility located on the OBIEE instance. 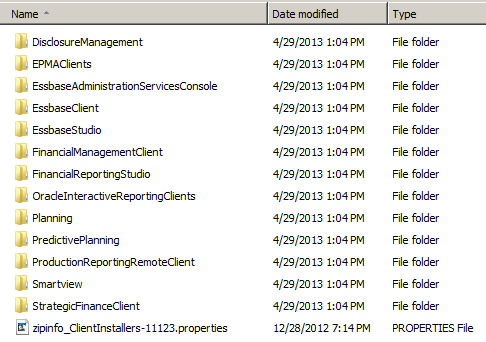 Also a file called registration.properties in the config directory requires updating with configuration information. 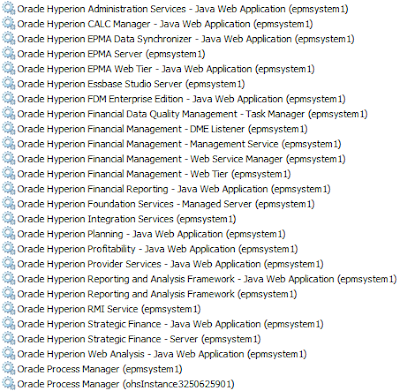 I don’t feel the properties really need any explanation except HIT (Hyperion Installation Technology) is the JDBC information for the EPM registry which can be found in reg.properties. register — Registers Oracle Business Intelligence with both the Hyperion Installation and Hyperion Shared Services. 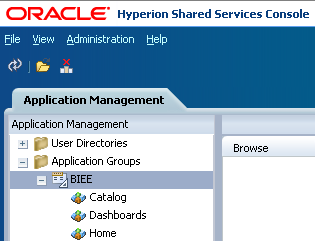 view — Lists the Oracle Business Intelligence registration information from both the Hyperion Installation and Hyperion Shared Services. clean — Removes Oracle Business Intelligence registration information from both the Hyperion Installation and Hyperion Shared Services. Running the utility with the view argument confirms that no OBIEE information has been registered with EPM Shared Services yet. 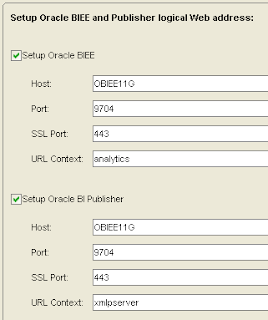 Running the utility with the register argument adds the OBIEE configuration information to the EPM registry. Firing off another registry report confirms the OBIEE information has been added. 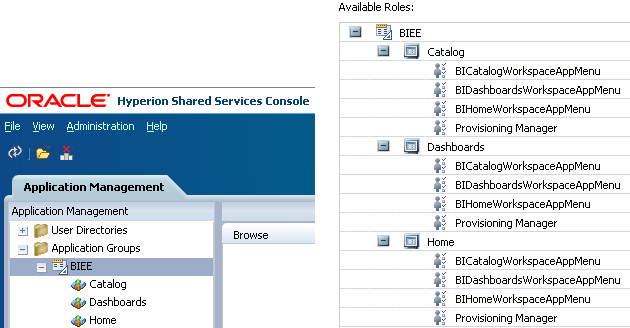 After restarting Foundation Services and logging into Shared Services new OBIEE provisioning roles are now available. The next step is to run the EPM configurator and configure the web server again as the proxy information for OBIEE needs to be added. Once completed you should be able to open up the http server configuration file and view the added proxy information, the configurator does not add proxy configuration for the BI office client, download link and composer so if these are required they will need to be manually added. Within the fusion middleware control SSO should be enabled and the SSO provider set to custom, selecting custom stops the authentication section in the instance configuration xml file from being overwritten which is important as the Hyperion authentication information is now going to be manually added. 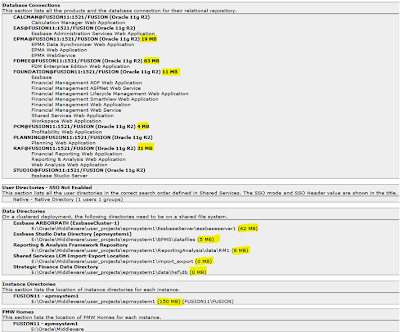 The instanceconfig,xml file is edited and “HyperionCSS” added to the <EnabledSchemas> setting. Now the system can be restarted and tested. 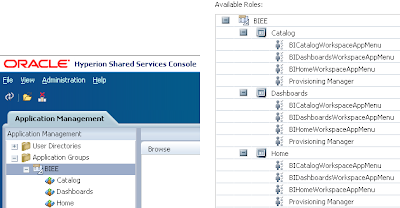 Once a user had been provisioned with the roles in Shared Services then the OBIEE menu options should be available in workspace. Selecting one of the menu options should then provide seamless integration with no additional login required and from then OBIEE security will take over.